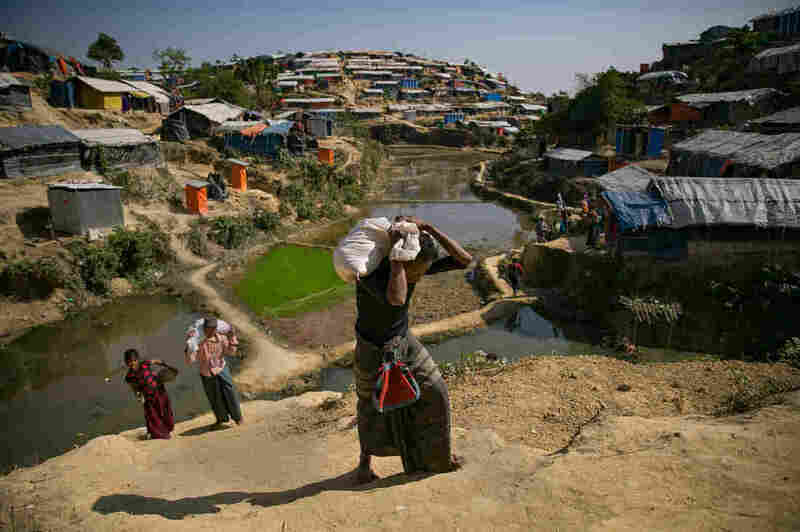 Controversial Plan To Send Rohingya Refugees In Bangladesh Back To Myanmar Has Been Delayed : Goats and Soda Bangladesh, which has taken in more than 650,000 Rohingya refugees, had announced it would start sending them back to Myanmar this week. But now the plan is on hold. That's fine with the refugees. Mohamed Yonus (dark shirt, green skirt) carries his distribution bag to his home in the Hakimpara refugee camp. Updated at 2 p.m. ET on Jan. 22 to cover the postponement of the plan to send refugees back to Myanmar. This week, Bangladesh had planned to start sending Rohingya refugees back to Myanmar. Now the deal has been postponed because of logistical problems. The refugees themselves have opposed the plan. "They'll kill us," says Sonah Meah, 30. "If I go, they'll kill me." 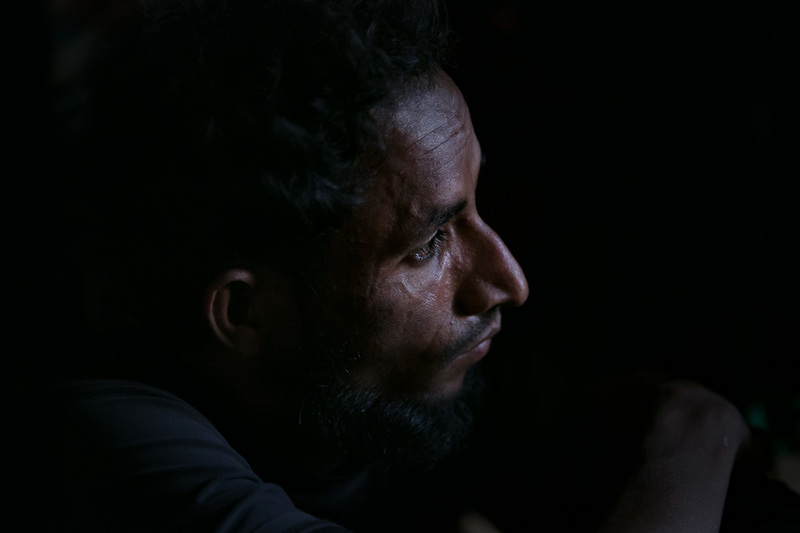 Sitting on a straw mat in his shelter in the Hakimpara refugee camp, Meah says he was tortured and left for dead by the Myanmar military in August of last year. He says soldiers accused him of being part of an armed group called the Arakan Rohingya Salvation Army — a charge he denies. 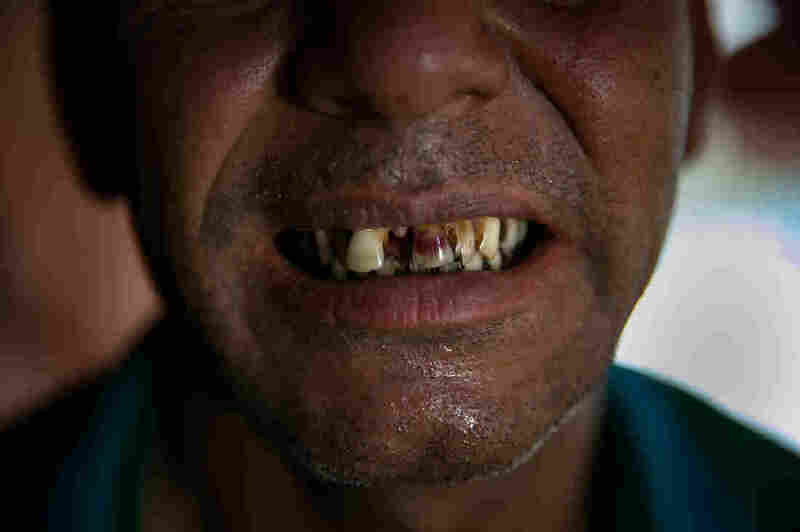 The soldiers knocked several of his teeth out, he says, and repeatedly beat him unconscious. NPR can't independently confirm his story but it is similar to the accounts of other Rohingya who say they were attacked by members of the Myanmar army. Meah is one of the more than 650,000 Rohingya who have fled Myanmar since the military launched what it calls cleanup operations against "terrorists" five months ago. Myanmar doesn't consider the Rohingya to be citizens even though members of this Muslim group have lived in the country for generations. The Muslim minority are treated as illegal immigrants and have faced waves of violence and harassment by government forces, pro-government mobs and Buddhist extremists. Last fall, the United Nations denounced the attacks as a "textbook case of ethnic cleansing." Another refugee, 30-year-old Shafika Khatun, says she won't go back to Myanmar unless the country grants citizenship to the Rohingya. "Without justice we will never go back," says 30-year-old Shafika Khatun. "We need our rights and our citizenship in Myanmar. Now if we go back they'll kill us." 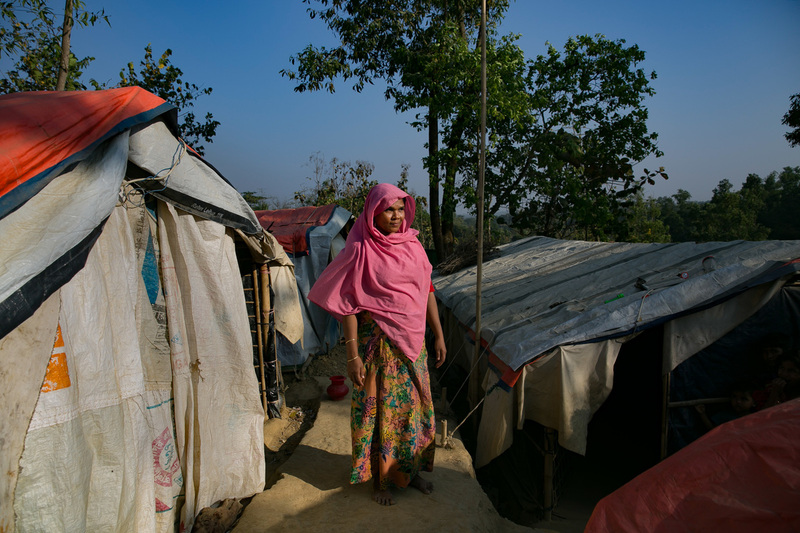 Shafika Khatun, 30, lives in what's known as the "widows' village" of the Hakimpara camp for Rohingya refugees in Cox's Bazar, Bangladesh. There are no men in the cluster of 34 shelters. Most of the women's husbands were killed in the recent violence. Khatun lives in what's known as the "widows' village" section in the Hakimpara camp — a cluster of 34 shelters covered with orange tarps. There are no men. Most of the women's husbands were killed in the recent violence. Khatun says her husband and son were arrested by the Myanmar military more than a year ago; she believes they are being held in prison. Khatun and the hundreds of thousands of other refugees are now living in refugee camps just across the border from Myanmar. The Rohingya have overwhelmed the vast stretch of Bangladesh where the camps are located. The hills where they've set up shelters are stripped of almost all their vegetation. Most of the trees have been cut down for firewood. Bangladesh officials have banned the refugees from taking formal jobs because of fears that they would flood the local labor market and drive down wages. This means the refugees are almost entirely dependent on international food aid to survive. Mohamed Yonus, who was a rice farmer in Myanmar, says he doesn't expect to leave the Hakimpara camp any time soon. "If the Bangladesh soldiers force us to go we will go," Yonus says. "But without our rights [in Myanmar] they'll kill us over there." Mohamed Yonus in his home in the Hakimpara camp. 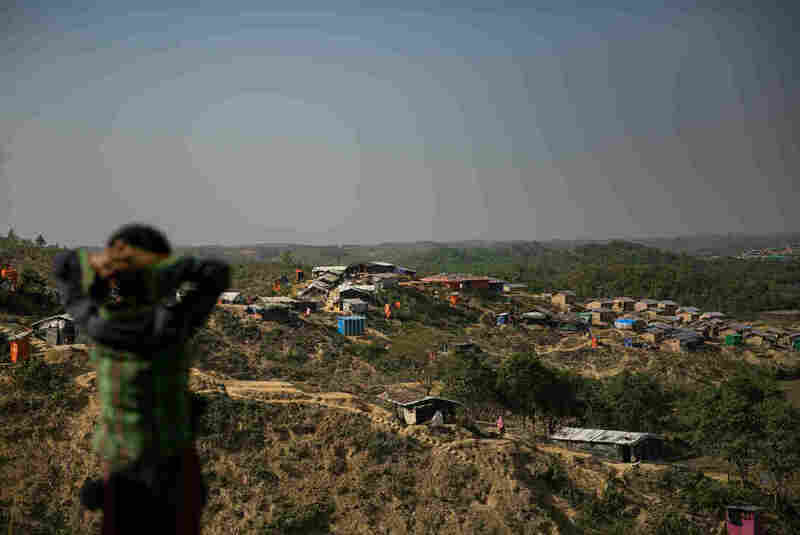 Bangladesh is making it clear that it wants to find a solution to this massive refugee problem sooner rather than later. Bangladeshi officials, however, have also stressed that repatriation will be voluntary and no one will get sent back against his or her will. Despite the delay, Bangladesh says it still plans to move forward with the repatriation, although it's not clear exactly when. Bangladesh officials say none of the refugees will be forced to go home against their will, yet the deal signed between Bangladesh and Myanmar calls for all the Rohingya refugees to be transferred to Myanmar over the next two years. 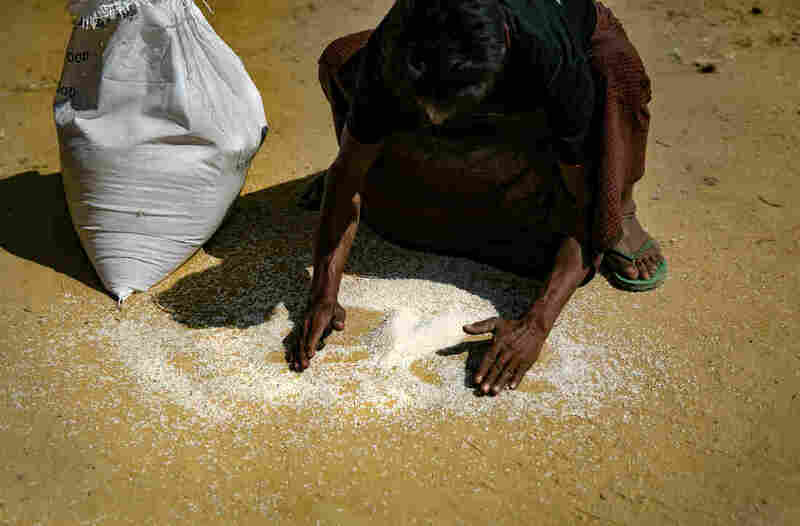 The agreement between Bangladesh and Myanmar excludes the U.N. High Commissioner for Refugees from the process even though the U.N. agency is usually involved in large efforts to return refugees to their homeland. 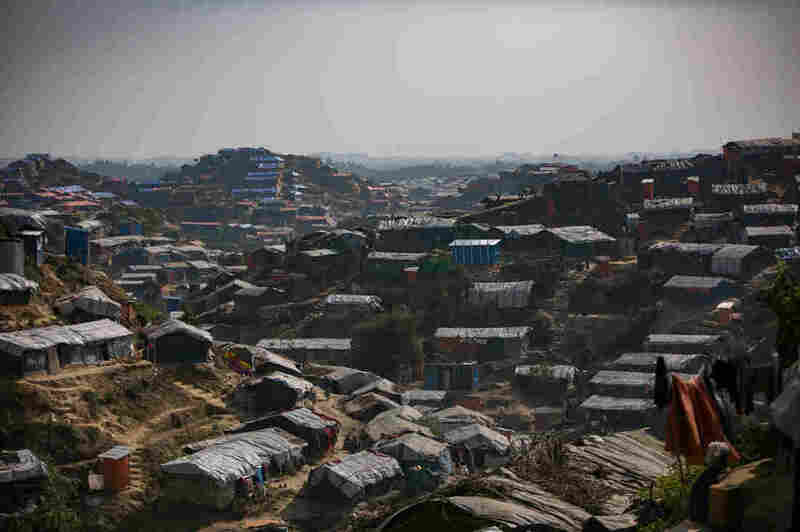 Meanwhile, conditions in the refugee camps in Bangladesh are improving. There are toilets and outhouses, and the World Food Programme is distributing rations. But the bamboo shelters have been erected on hillsides that are basically just sand, and there are fears that when monsoon season starts in May or June the camp will turn into a mud pit. Even though conditions are problematic, the refugees who spoke to NPR said they feel safer in Bangladesh than in Myanmar. Khatun says she worried that the Myanmar government will take the Rohingya back but force them to live in camps once they arrive. "We want our land, we want our houses, we want our rights," she says.